This manuscript contains an abridgement of the Bible which encapsulates the history and generations of men and women presented in the Old and New Testaments and gives moralising interpretations of them. 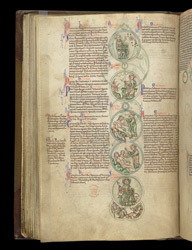 Many of the pages are set out with diagrams showing the sequence of events and God's actions within them. This abridgement has been traditionally attributed to Peter of Poitiers, who was professor of theology at the University of Paris in the late 12th to early 13th centuries, but it is far from certain that he really wrote it. This page has, from Genesis, the creation of the stars, sun and moon in the heavens, of the birds, of the animals and Adam, of Eve, and finally the sabbath, the day of rest. To the left, the text of Genesis was written and, to the right, moralising interpretations on each episode. God was shown as the Son, with a cross in his halo, to affirm the doctrine that Christ was eternal.